Apparently our chant at the Round 1, Game 1 of the play-offs swayed the voting judges. Mayhaps they shall win again. At any rate, the Mavs/ Rockets series has been great. Randy posted today with a surprise challenge to The League. Go read it here or else the rest of this post won't make much sense. First of all, I haven't really gotten involved in this whole Podcasting brouhaha. I am not entirely clear on what it's all about, but people seem to enjoy it. The League has never been an early adopter of technologies, and also finds it difficult to do requests. 1) The League's voice is sort of a nice, flat monotone. It's sort of a mid-range, droning, honking sound. It's awful. Nobody is going to want to listen to that for more than ten seconds. 2) The League requires the time between thought and typing in order to create this unique little universe you see here. Just talking...? Eh. The League doesn't do so well. a) The League has remained friendly because The League doesn't suffer much for politics. Sure, The League is willing to have a nice, reasoned debate, especially when given time to collect The League's thoughts. But The League doesn't watch shouty point/ counter point shows and would rather not add to the mayhem. And here's a secret. I do want to listen to other viewpoints and consider what they've got to say and maybe take it in for a while. I'm not sure what anybody has to gain by me shouting dumb talking points at somebody else's dumb talking points. b) I assure you, League HQ IS NOT a wild and crazy place to live. If it were, The League would probably not spend its days and nights obsessing about the adventures of musclebound aliens. Further, Jeff, Lucy and Mel cannot actually speak. At least not into a microphone. c) If you think the League's voice is annoying, doubling that effect by adding in Steanso isn't going to endear us to anybody. Steanso and The League are virtual voice-clones and share a great deal in the way of colloquialisms and usage of the word "dude". And what do you mean "descend into drug addiction and egomania"? I assure you, we are entirely there already. The League spends his evenings hopped up on Justice League vitamins and preening in front of a mirror trying to get his Superman spit-curl just right. (And I confess... it takes no small amount of ego to maintain a blog like this day after day). I'm not totally ruling out any possibilities regarding the Podcast. The largest factor is that I haven't determined how much of a hassle this would be. This is totally unrelated, but does anybody else think that Barkley might be drunk out of his mind on each and every episode of Inside the NBA? The man is a maniac. Anyhow, I'm not really sure The League would translate well to radio. Thanks, Randy! I appreciate the vote of confidence/ delusion that the League might be fun in other media. It's this kind of support that gives me the uncontrollable ego which Jamie is beginning to find oh so oppressive. The League has a confession to make. The League watches American Idol. The League even VOTES for his favorite contestants (God bless toll-free numbers and re-dial). Thanks to the power of Digital Video Recorders, Mrs. League has managed to cut the entire hour long program down to about 10 minutes. No commercials. No Randy, no Paula, just enough Simon to hear his verdict and cheer him on as he craftily manipulates the voters of America. I don't know why I watch the show. I mean, it's a stupid show, the performers are somewhat talented, but the style of music doesn't appeal to me in the slightest. I am also well past blaming Jamie for my viewership. So, of course, this evening I watched the entire Corey Clark deal on ABC. And here, I must get in lock-step with Randy. I'm an American and I'm an idiot, and the news magazines have no trouble exploiting that to boost ratings. Across the planet we have avertable catastrophe after avertable catastrophe, but this evening I dedicated an hour of my life to watching this sorry excuse for a human being "admit" to having had relations with Paula Abdul. And I think Jim or Randy was going to write a biting editorial on the North Korean situation, but it hasn't appeared yet. Now, let me clarify: If I had known pretty much any famous person the way Corey claims to have known Paula Abdul, I'd probably want an hour of prime-time TV to tell people about it, too. However, I wouldn't be trying to get a recording contract and a book out of it. I just like to share. You can read the various reports which are probably trickling out on CNN.com, Yahoo! News, etc... The evidence which Clark provides is circumstantial, but that certainly doesn't mean that it isn't pointing an enormous glowing arrow toward Corey's camp. Corey appears to be a complete jackass, but that doesn't mean he's lying. And just because he's not lying doesn't mean he isn't absolutely without talent. I had forgotten in the two years since he was on TV how truly awful that guy really is. Anyway, after the full hour of prime time TV dedicated to this nonsense, our local affiliate spent 5 minutes covering the exact same story we'd spent an hour watching, then would update us every commercial break to tell us lots of people were voting online whether or not they believed Corey. 98% of people didn't believe him. 98%. Sure, he's an untrustworthy schmoe, but what, exactly, did Paula Abdul to gain our trust? Was it the dancing cartoon cat that won us over? Was it the failed marriage to Emilio Estevez that had us thinking, "She cannot tell a lie!" Or was it the hit-and-run car wreck from earlier this year? Or the revelation that Paula's been hopped up on goofballs for the past few seasons of AI thanks to some back injury. The important thing is that the Spurs won a decisive victory and are on to Round 2 in the play-offs. Oh, Leaguers. I am unsure of how to entertain you this evening. I don't have time for a "DITMTLOD" or any of my other wildly amusing columns. Honestly, with two weeks down of me being sick, Jamie then being sick, and Lucy being sick in the middle... I haven't had much time to ponder the imponderables and dream up worthwhile ways to waste your work day. Not to mention work. I work at a large, state university and classes ended today. Because I am responsible for delivery and creation of classes, in theory I should be breathing a sigh of relief. But the fact is, we have summer classes coming up, Fall classes to think about, and other projects to work on as well. It never ends, people. DC Comics are continuing to rock my socks off. The titles are now clicking into one another like cogs on a a crazy comic book machine. It's a heck of a fun time. So, you know, when you GO TO FREE COMIC BOOK DAY, you can pick up any of DC's titles and jump into the frivolity. Because I want to be fair, I want to mention that DC's oft-less than friendly competition Marvel is not exactly run by chimps. They've also got a big cross-over event going on under the title "House of M". It helps to have read "Avengers: Disassembled" in order to enjoy the series, but I am sure "House of M" will be fine on it's own. Nice little side story. Apparently the cover artist for one of the House of M books cribbed an image of the King of Spain for his portrait of Magneto. Apparently the King of Spain's people found out and they are not amused. Read here. The somewhat "edgy" X-Men spin-off series, X-Statix, was pretty much brought down about two years ago by a remarkably poor decision to have a story in which real-life/ real-dead Princess Diana was brought back to life as some sort of mutant superhero. Seriously. I understand wanting to be edgy or whatever the hell people do when they want to draw attention to themselves. As long as it generates a decent story. Apparently I have more of a nose for controversy than the publishers at Marvel, because at least I saw that the British Royals might not think too highly of this particular idea. It appears that Marvel's execs caught wind of what Marvel-publishing was up to after the movie-end of the Marvel business walked into several meetings in Hollywood and ran into angry folks who had known the real life Princess Di. The comic was, of course, changed. But it was, of course, entirely too late. The controversy was one of several factors that brought Marvel's then-President Bill Jemas down. That, losing all of their decent talent but Bendis and telling both customers and retailers to go jump in a lake. Funny how things work out. I know. I'm shocked, too. I had no idea Spain still had a king. Anyhow, there's something to for you to read up on. 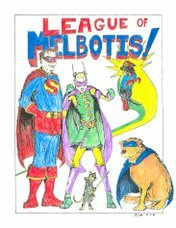 As you might have noticed, The League of Melbotis has a passing interest in the comic book format of sequential art-storytelling. We at The League hope that you, not at The League, will take the opportunity presented by FCBD and check out the wide-world of comics. It appears every store handles this event differently. Austin Books on Lamar in Austin, TX gives out one copy of each comic to all comers. While my local shop, Atomic Comics, gives out one comic per warm body. Atomic Comics is also at the mall and has a lot higher foot traffic. Personally, I think giving out as many different comics as possible is a better business model. It widens the chances that new and old readers will try something on which they never read before. While at the shop, I suggest you take a look at what's on the shelf. Some neat books are out there for every taste. If you don't know where to start, try asking one of the erstwhile employees of your shop for some hints and clues. For help finding a shop in your neck of the Hyperverse, you can check out the Comic Shop Locator. I am sure Jamie found this by way of Doug. I believe the Mysterious M will enjoy this most of all. yes, I did watch part of the Sci-Fi Channel's Saturday night movie, "Man-Thing." yes, it is based upon an obscure Marvel Comics character from the 1970's who is a rip-off of DC Comics' popular and critically acclaimed comic series Swamp Thing. No, nobody has read a Man-Thing comic in years. No, I do not know why they chose THIS character to adapt to film. Especially after Swamp Thing has been translated to 2 feature films, a TV series and a cartoon (as well as an unpopular line of toys). Yes, Man-Thing was originally slated for theatrical release, was decided to go straight to DVD, then bypassed that and went straight to basic cable. Yes, the movie was that dumb. Which means comic fans will choose this particular movie to champion and claim "it wasn't that bad." My friends, it was, in fact, that bad. It might even be Mansquito bad.